When this card enters play, put 3 Momentum counters on it. When involved in a faceoff, this card has +2 power for each Momentum counter on it. 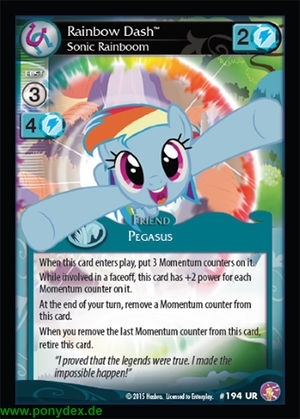 At the end of your turn, remove a Momentum counter from this card. When you remove the last Momentum counter from this card, retire this card. "I proved the legends were true. I made the impossible happen!"